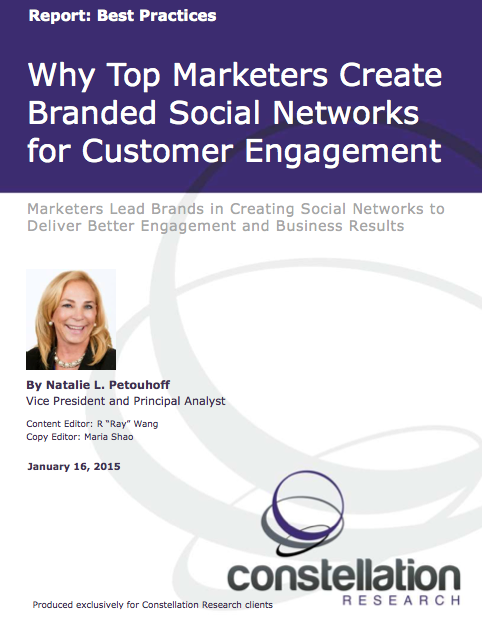 Why Top Marketers Create Branded Social Networks for Customer Engagement | Constellation Research Inc. In the business environment that dominated the past few decades, successful marketers helped drive business value by demonstrating proficiency in customer acquisition and lead conversion. In the digital era, however, top marketers help their brands reap the business value of using branded social networks to drive enhanced customer engagement/experience. The business value of branded social networks comes from the simple idea that forward-looking brands should reimagine their businesses as social networks of customers, fans, partners and many stakeholders who share an enthusiasm for the brand and thus provide the essential elements of a top-performing, revenue-generating brand. This report explores how smart marketers can apply investments in social networks to drive business results. Constellation provides key criteria for marketing leaders to evaluate when selecting a brand-owned social network technology. In addition, Constellation shares six best practices for successful deployment of brand-owned social networks. Branded social networks have emerged as a powerful tool used by leading marketers to drive business value. This research explores why organizations should adopt branded social networks and how they can achieve business results through such networks.